Ron Moody, as Fagin, is seen in a 1968 publicity portrait for the film Oliver! 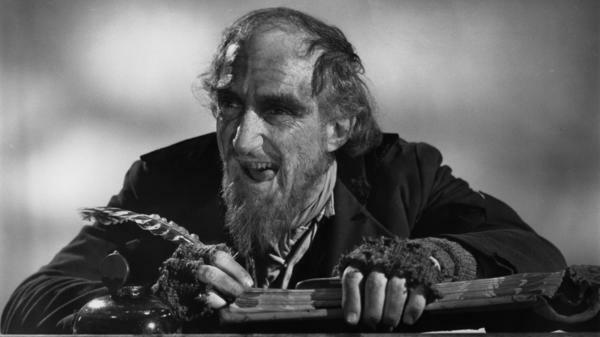 With a scruffy beard and devilish twinkle in his eye, Ron Moody's Fagin is one of the most memorable, musical theater villains of all time. Moody died Thursday at a hospital in London. He was 91. As the guardian of his band of little thieves in Oliver! Moody's Fagin was a fearful imp who squirmed in the presence of the menacing Bill Sykes. He was also sweetly paternal. When he sings "Be Back Soon" to his team of scrappy ruffians as they head out for another day's work picking pockets, Moody seems genuinely wistful. Based on Charles Dickens' Oliver Twist, Oliver! won six Oscars in 1969, including best picture and best director. Moody was nominated for a best actor Oscar (Cliff Robertson won for Charly) and won a Golden Globe. Ronald Moodnick was born in North London. His parents were of Russian-Jewish descent. Moody attended the London School of Economics but cherished his hobby appearing in musical revues. Had he not become a professional actor, Moody once said, he would've been an accountant. Throughout his career, Moody played a variety of parts on stage and screen: Captain Hook in Peter Pan; an actor/manager in the Miss Marple movie Murder Most Foul. He was the greedy count Ippolit Vorobyaninov in Mel Brooks' comedy Twelve Chairs. He had numerous guest appearances on such TV shows as The Avengers and EastEnders. One of his big regrets, he often said, was turning down the chance to play the lead in Doctor Who. Moody once told NPR he was raised on American musicals from the 1930s. "When I was young, they [Americans] were the great masters of the musical," Moody said in a 1988 interview. "I'll never forget seeing Guys and Dolls over and over. I used to sit up in the coliseum watching this magnificent musical. Brilliant." A notorious improviser, Moody had a reputation for changing up lines to get bigger laughs during the London stage version of Oliver! -- something his fellow actors apparently didn't like much. In a 2006 interview with the Wales on Sunday newspaper, Moody defended himself, saying, "I grew up with music hall and revue and was used to filling in the little gaps here and there to get bigger audience reaction." He added that there are two kinds of actors: "The anarchist to whom the theatre is a playground and the neurotic to whom it's a cage." Moody knew that in Fagin, he'd found the role of a lifetime. At a 50th-anniversary production of Oliver! in London, the actor, who was then 80, said the show had "magic" and even performed a rendition of "Pick A Pocket Or Two" with the cast. No doubt countless young actors have pinched a few ideas from Moody on how to play Oliver! 's sly, singing swindler.